Engraved wine glasses have a subtle yet unmistakable air of elegance and sophistication. This is because they are often associated with special occasions and distinctive events. It could also be because it holds a drink that is considered to be stylish in its own right. If you are looking for a tasteful and classy way to promote your brand, you needn’t look any further than engraved wine glasses. The engraving is usually quite subtle, your guests may not notice it at first but when they do, you can be sure it will be impossible to forget.They will be thinking of your company and celebration for a very long time. What is the image that immediately comes to mind when you think of wine glasses? To me wine glasses definitely conjure up images of sophistication and class and when you gift them to investors and customers, it is sure to evoke the similar reaction with your clients. Wine glasses are in a class of their own and when engraved have a high perceived value and set a standard that most other gifts will find impossible to touch. Give a set to somebody who loves to drink wine and you can be sure they will be so impressed they will want to patronize your company forever. Different types of wines require different types of glasses to emphasize their aroma and flavour. Narrower wine glasses are best for white wine. These glasses are neither frosted nor coloured. They are just plain transparent so the person drinking it can fully appreciate the colour of the wine. The narrow shape of the glass allows the chilled wine to retain its temperature. A Bordeaux glass is tall and narrow and is usually used for serving red wine, which generally had a more robust flavor. The distinctive shape of these glasses allows the drinker to enjoy the full-bodied taste of the wine. A champagne flute is designed to be slightly narrower than the regular wine glasses and it has tulip-shaped sides. The shape of these glasses helps to prevent the bubbles from escaping. Hock glasses are one of the few coloured wine glasses. These glasses look like tiny coloured bowls with a twisted stem and base. The Grappa glass was specifically designed to drink Grappa, which is an Italian alcoholic drink. This glass is about 7” in height and has a unique balloon shaped glass that lies in between the stem and the glass itself. Any of these glasses can be engraved and used for promotional purposes. One of the many reasons why engraved wine glasses are a brilliant idea for using as corporate gifts is because it is a very high end way to market a small business without going over your budget. They make a nice welcome gift to new clients and are also a superb way to show your appreciation to loyal long-term customers. Anyone who receives a wine glass will know that they are valued and that they are doing business with a company that appreciates them. Engraved wine glasses also act as a great incentive when given out to employees. A great time to give out these classy items is around the holidays when people tend to drink more wine. As always, first impressions count. 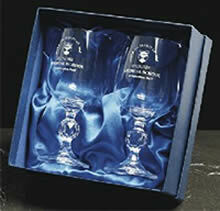 Presenting your wine glasses in good quality gift box will add considerable value to your gift. I suggest a cardboard, satin lined gift box which could also be personalised with you logo or message if desired. Alternatively a tin or wooden box could be used, with a fitted compartments or padded lining to protect the glasses. If purchasing small quantities of glasses it is generally more cost effective to use your supplier’s stock range of packaging, which will be suitable for either single glasses or larger sets, usually 4, 6 or 8 units. If you are considering gifts to 100 or more clients then it would be worth considering a bespoke box, you can then specify the colour and style of your presentation packaging for truly unique finish. Naturally the price of engraved wine glasses will differ depending on the style and quality of glass that you choose, as well as the quantity of glasses you are planning to buy. Purchase the finest quality possible within your budget. The glasses are carrying your message, name or corporate brand, therefore paying a little bit more is still worth it, considering the long term goodwill they will create which is sure to benefit your business significantly. Complete Buyers Guide to Logo Shirts includes - types of shirts, pros and cons, branding options, tips and advice, product suggestions with wholesale prices. Buyers guide to business personalised keyrings, includes: types, materials, customisation, branding. Over 100 promo keyrings available from just 24p. Buyers Guide to inexpensive promotional products: including top 5 items from just 6p, pros and cons, how to choose, price guide, printing and extras. I promise to use it only to send you Promotional Gifts Guide E-zine. Copyright & Copy 2014 promotionalgiftsguide.com, all rights reserved.